Many of our top musicians have died in recent times. The possessions and money of some of these musicians have become a subject of clashes between family members and relatives. The clashes over who will inherit certain possessions have even been brought before the courts. Their problems are sadly shared by millions of people. If the two musicians, as well as a lot of other South Africans, had taken time to draw up a will, such fights over possessions and money would be avoided. A will is a document which sets out how your assets should be distributed among your children, relatives or friends after your death. 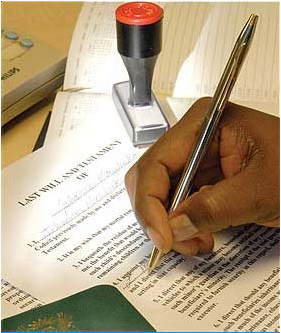 There are certain steps to take before a will is seen to be valid in the eyes of the law. The witnesses, as well as the person making the will, must sign the last page. A will must be kept in a safe place with either a relative or a lawyer. You don't need to have a lot of money to have a will. A will could include your wishes about what should happen to your possessions after your death like your house, car, insurance policies, pension money, land or cattle. Your will should also have information about who would be responsible for dividing your possessions after your death. It could also include details like where you want to be buried and who should bury you. Clear instructions about such things will solve problems that arise after your death and will prevent expensive legal battles. If a person had lots of money or assets, it would be advisable to appoint a lawyer to take care of his or her estate. But for smaller estates, a relative or friend would be the best person to handle it. Assets: Items of value which you own, like cash, furniture, land, a car or cattle. Estate: Total assets of a person at the time of death.